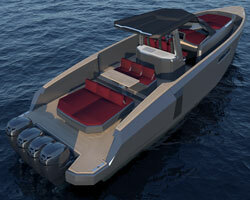 Evo Yachts, Italy has unveiled its 13.04m x 4.52m Evo Center Console (Evo CC) concept. This new motor yacht class has been developed to incorporate a propulsive arrangement comprising either three or four 261kW-rated, or three 298kW-rated, Mercury Verado outboards. The GRP vessel was constructed using vacuum infusion, and features a displacement of 8,200kg (without the outboards) in unladen mode. The yacht can carry up to 12 guests and houses two dedicated berths. Additionally, a below-deck dinette can be converted into an extra, surrogate cabin, thus creating an additional two berths if so required. Other features of the Evo CC include: a carbon T-top on deck, to offer crew and guests respite from the sun; a 2m x 2m sun lounging pad; retractable bollards, fender and anchor; and the capacity to carry 1,000litres of fuel.